The story of Thomas More, who stood up to Henry VIII when the king rejected the Roman Catholic Church to obtain a divorce and remarriage. A perfect sequel to the popular BBC television series, Wolf Hall. Free admission by ticket. Thomas More, The Utopia of Sir Thomas More. 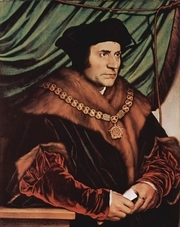 Thomas More is currently considered a "single author." If one or more works are by a distinct, homonymous authors, go ahead and split the author. Thomas More is composed of 40 names. You can examine and separate out names.